Amanda Nunes put on a dominant performance to finish Raquel Pennington in the fifth round of their main event matchup at UFC 224 on Saturday night. After the fight was over, Nunes then found out that after the fourth round was finished, Pennington went to her corner and told her coaches that she was done yet they insisted on sending her out to finish the fight. It all unfolded on Saturday night in Brazil after Nunes brutalized Pennington with a series of knee strikes in the fourth round that left the challenger with a severely broken nose. After the horn sounded, Pennington sat down in her corner and said ‘I’m done’ and then turned to her coaches before saying ‘I want to be done’. 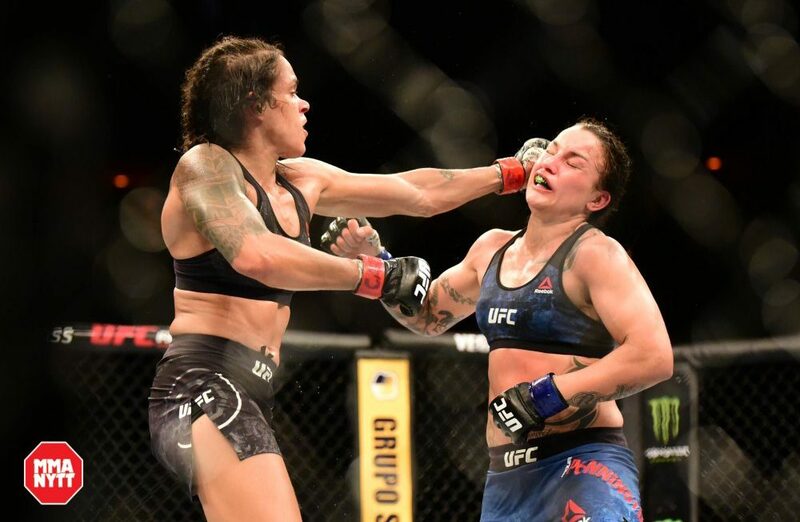 Despite that plea, Pennington’s coaches refused to call off the fight and insisted that she answer the bell to go back out for the fifth and final round. The end result was Pennington’s nose being mangled even worse before the referee mercifully stopped the contest as Nunes was just pouring on the punishment without any kind of resistance from her opponent. After the event was over, Nunes criticized Pennington’s coaches for refusing to listen to their fighter and then sending her back out to take an unnecessary amount of damage in that fifth round. “It’s sad. I didn’t even know, Nina [Ansaroff] told me in the locker room. It’s sad because you could avoid something. She went to the hospital and it might be a bad injury for her to go to the hospital,” Nunes said at the UFC 224 post fight press conference. “I already asked Nina to text her and find out if she needs anything, I’m here. It’s sad. If she didn’t have right conditioning to fight, then the coach should have thrown in the towel for sure. I think my coach wouldn’t let me go through that. While it’s not likely that Pennington will take offense to what her coaches did by sending her back out to fight again in that fifth round, Nunes just saw no reason for it to happen. In that situation, Nunes believes it comes down to a relationship between fighter and coach to know what’s best for them and in that moment she doesn’t feel Pennington had the right person in her corner. As of now there’s no update on Pennington’s condition after the fight as she was taken to a local hospital for treatment following the event.